All American Stone and Turf offers professional grade mulch and soils available for delivery to The Woodlands and surrounding areas. Quality Mulch is one of the most beneficial sources for assisting with water conservation and improving soil quality. With the intense summer heat of Texas, quality mulch will help protect your soil from excess drought. Mulch is an essential ingredient for plant growth and works by slowly decaying over time, releasing nutrients for plants to consume. It’s also great for reducing the spread of weeds and helps keep soil in place during stormy conditions. The next most essential ingredient is a healthy top soil. Top soil is full of organic matter and micro-organisms that also assist with providing plants with nutrients. 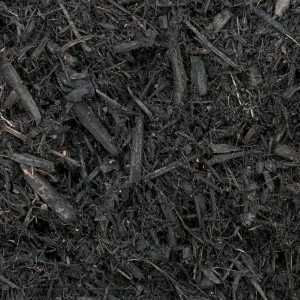 A premium hardwood bark mulch finely shredded, naturally enhanced with ash to a rich black color. All-natural chemical free product with no dyes. The preferred black mulch of landscape professionals. A premium hardwood bark mulch finely shredded, aged to a natural dark color. All-natural chemical free product with no dyes. Our most popular mulch. Cedar mulch offers an excellent option when it comes to perennial flower beds and other landscape gardens. Cedar mulch and other wood mulches help improve the structure of the soil, while keeping the beds warmer and hindering the growth of weeds. A mixture of half Black Gold and half Screened Topsoil, used for pre-lawn establishment. This mix will help your sod initiate rooting by providing high levels of nutrients, organic matter, and microbes into the soil. Screened topsoil is ideal for starting a new lawn or garden or improving the soil in any given area. Worked into existing soil, screened top soil improves its texture, dexterity and water-retention properties. A blend of our highest quality screened topsoil, nutrient rich compost and sand loaded with beneficial soil microbes. An excellent multi-purpose growing medium for fine grading or top-dressing lawns, also great for planting and building raised landscape beds. Need landscaping soil or mulch delivered to your project? We can handle that! We delivery landscaping soil and mulch around The Woodlands, Texas. Rather your project is around the yard or if its a giant commercial project, we have trucks ready to delivery your chosen landscaping soils and mulch right to your project.